Unfortunately, like many other historic resources in Newark’s central business district, this building too fell victim to the hockey arena and road realignment plans of the City of Newark. City officials ignored an Executive Order 215 that requires an environmental impact statement be submitted to the NJDEP for assessment and the building was demolished in June 2006. The Newark Fire Department built this Renaissance Revival station when the city’s fire equipment was still horse drawn. One of four stations that served the central business district, it housed three companies: Engine Company No. 1, Truck Company No. 1, and Water Tower Company No. 1. The two-story, five-bay building has façades of beige brick and limestone and neoclassical ornamentation. Although somewhat altered, the national-register-eligible building retains architectural significance as an example of restrained classicism on an early twentieth-century institutional building. The firehouse, the last active inner-city fire station in Newark, has been in continuous service since its construction in 1908. 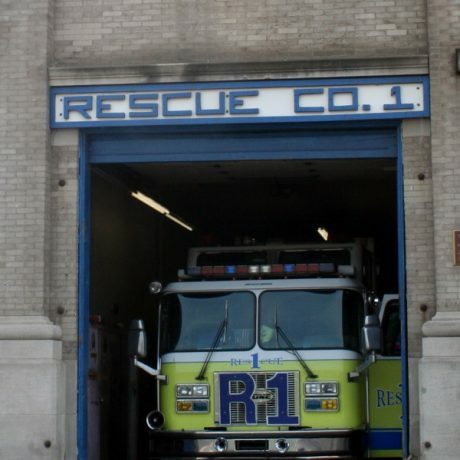 It now houses a hazardous materials unit and a rescue squad, but it is not clear the station will reach its centennial because the building is threatened by a road realignment, which calls for straightening of historically winding streets. The new traffic pattern will accommodate both the volume of cars expected at the New Jersey Devils hockey arena currently under construction as well as prepare the area near the new rink for possible future redevelopment. The arena construction has been bad for a number of historic resources in Newark’s central business district, particularly those in the Four Corners Historic District, adjacent to the firehouse. The project exemplifies the city’s disregard for its historic resources, particularly its historic firehouses, some of which have been decommissioned and sit vacant, with no plans for their adaptive use.